Sky is a luxurious 71-story tower with rental residences designed by Rockwell Group, ranging from studios to 2 bedrooms, including the VUE penthouse collection. Located at the nexus of two dynamic neighborhoods, Hell’s Kitchen and the Hudson Yards District, Sky is just blocks from world-class theater, restaurants, the High Line, Hudson River Park, and West Chelsea’s art galleries. Sky epitomizes modern refinement. Arrive at a gracious infinity loop motor court surrounding a custom sculpture by Yayoi Kusama, before entering a grand lobby of warm and marble textures. Centered around an artisan-made Lasvit chandelier above the concierge desk, the lobby is beautiful and inviting – flanked by two hand curated art libraries with fireplaces. is a temporary nonprofit art center located in the heart of Manhattan, New York, created to present the exhibition Ugo Rondinone: I ♥ John Giorno, produced by Frahm & Frahm and Moinian Group. Versatile and ever-changing, the almost 10,000 square foot space and 30 foot high ceilings allow for the display of large-scale sculpture and site-specific installation, giving ambitious scope for a variety of curatorial projects. As part of the complete Sky Life experience, The Art at Sky is one of our most impressive amenities to tenants, allowing them to live amongst their very own collection by some of the most prolific artists of our time. From the custom paintings in the Art Library and hand-curated collection of art books and Kusama Garden, Sky is a gallery belonging to all residing here. Founded by Joseph Moinian, The Moinian Group is among the few national real estate entities to develop, own, market and operate properties across every asset category, including office, hotel, retail, condos and rental apartments. Since its founding in 1982, The Moinian Group has thrived with a portfolio in excess of 20 million square feet across major cities including New York, Dallas and Los Angeles. The Moinian Group has been a pioneer for the development of state-of-the-art, visually distinguished properties. 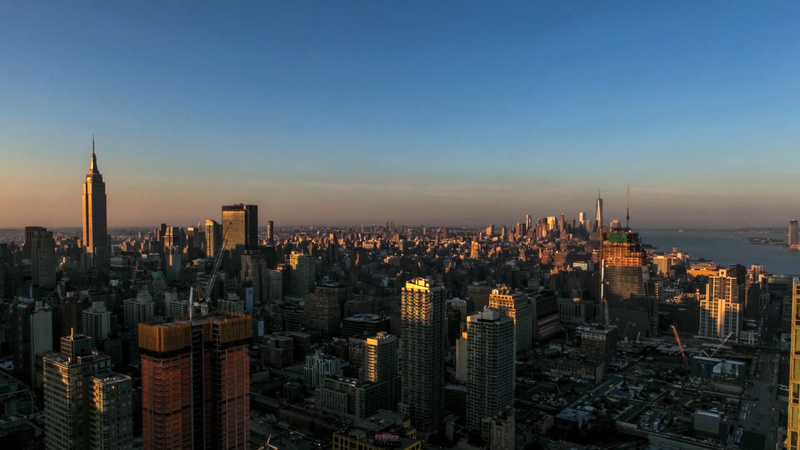 The firm continues to strive for excellence in their focus on the growth of emerging areas of New York City such as Downtown and the West Side of Manhattan where they are currently developing over 4 million square feet. Life Time is a privately held, comprehensive health and lifestyle company that offers a personalized and scientific approach to long-term health and wellness. Through its portfolio of distinctive resort-like destinations, athletic events and corporate health services, the Healthy Way of Life Company helps members achieve their goals everyday with the support of a team of dedicated professionals and an array of proprietary health assessments. In addition to traditional health club offerings, most Life Time Fitness centers include an expansive selection of premium amenities and services in a resort-like setting. Amenities include indoor and outdoor swimming pools, basketball and racquet courts, personal training and group fitness programming, cafés and spas. Bold New York has revolutionized the real estate industry in Manhattan and Brooklyn. Officially launched in late 2010, BOLD specializes in residential leasing, sales and new development marketing. They are experts in the project-based, luxury residential market and are dedicated to implementing innovative strategies and processes from start to finish. The BOLD team is comprised of hand-selected agents who are pioneers in the industry, passionate, and specialize in delivering the highest level of service to New York’s most discerning clientele and owners alike. BOLD also provides best-in-class technology to make the process of buying, selling, or renting a home intelligent, paperless and seamless. BOLDS’s consistent performance record and commitment to success exceeds expectations at every level. Based in downtown New York with offices in Madrid and Shanghai, we specialize in a wide array of work from luxury hospitality, cultural, and healthcare projects, to educational, product, and set design. A combination of interactive technology, handmade objects, custom fixtures and furniture create environments that seamlessly integrate technology, craftsmanship and design. Crafting a unique and individual narrative concept for each project is fundamental to Rockwell Group’s successful design approach. From the big picture to the smallest detail, the story informs and drives the design. Goldstein Hill & West Architects (GHWA), architect of Sky, is a New York City-based architecture firm renowned for the creation of the highest quality residential buildings. The firm has worked with many of the nation’s most talented developers to create beautiful towers that grace the New York skyline. Ranked by Architectural Record as one of the world’s top 300 firms, GHWA is made up of more than 100 professionals. By incorporating the latest technologies and amenities with elegance and grace, GHWA’s projects deliver enduring value for the residents they house and neighborhoods they influence. Founded in 2009 by principals Alan Goldstein, L. Stephen Hill and David West, GHWA has a legacy of excellence in design spanning more than a quarter century. Based in NYC, Tom Balsley and his studio, Thomas Balsley Associates, have established themselves as design leaders of the built landscape throughout the U.S. and abroad. The team of landscape architects, urbanists, and planners serve the public and private sectors as well as the public/private partnerships that so often sponsor the notable open spaces of our time. The studio has earned an international reputation for its award-winning and innovative project portfolio of every type and size ranging from master plans to small urban spaces; from sweeping urban waterfronts and parks to institutional, corporate, and residential landscapes; from winning competitions to public seating designs.